Ever wished you knew how to go on living the good life in tough times? 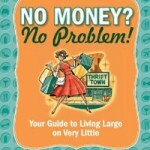 Frugality is the new reality, but doesn’t mean you have to sacrifice your lifestyle and turn into a no-fun cheapskate. In fact, after reading this book, you’ll find that frugality can be a blast and you can still end up with more money left at the end of the month instead of the other way around! Littered with good humor, readers will find practical cost-cutting advice and too often that same advice leads to a better-quality life when you volunteer at a live music venue to hear your favorite band and get to participate directly in the process, giving you perspective you would never have experienced sitting in the front row. No Money? No Problem! has a lot of fun showing readers that living within your means requires enlightened consumption habits, but that these choices have far-reaching ripple effects. The book features re-occurring side bars and icons to help readers navigate chapters, including True Stories profiling real-life creativity out there in Frugal Land, reminders of obvious tips that are such no-brainers we forget them, For Love or Money with tons of volunteering options, Crazy Ideas lists for things you absolutely should not be doing, and a wonderful list of online resources. No Money? No Problem! synthesizes the collective know-how of poor-but-happy folks like grad students, professional writers, filmmakers, musicians, artists, and others who – let’s face it – are broke much of the time. In this bruising economy, there is something in this guide to low-cost, high-quality living for everyone and at the end of the day, it’s not about having less, it’s about living well on less.